According to the statistics of the search system, Skyscanner.ru, Barcelona is among the five most popular cities among Russian tourists. 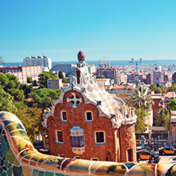 Skyscanner made a selection that will inspire the trip and help you tune in to the rhythm of the capital of Catalonia. What is special about these songs, the editorial board tells on its website. Listen to the collection Barcelona in high quality, absolutely free. You can listen to the whole collection, or separately song by song. In addition to Barcelona of the collection, you can find any other one by following the link and get information with the already collected collections and collections of tracks, songs and music.